GET MARKETING MATERIALS FOR YOUR PROPERTY LISTING -- IT'S AUTOMATED AND COMPLETE! 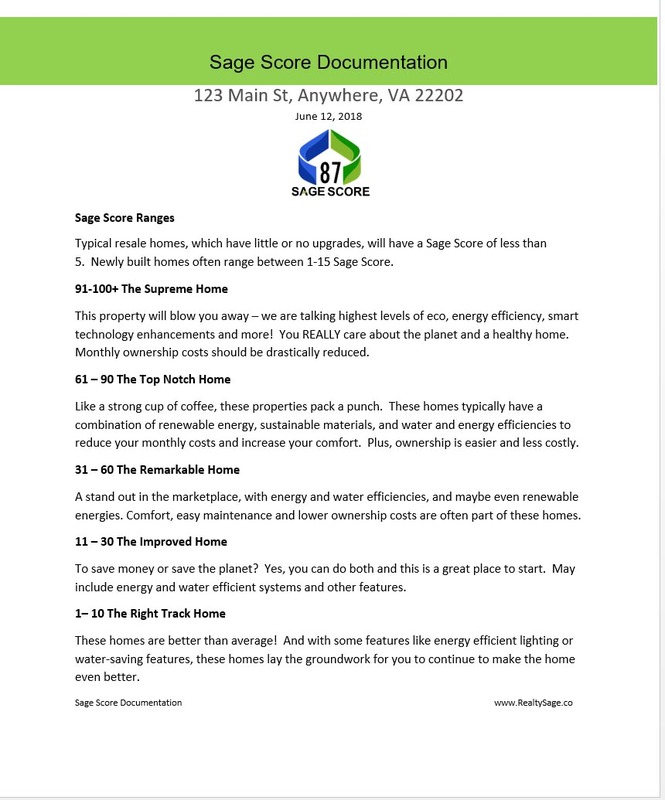 Market your Sage Score with Realty Sage’s Marketing Materials and showcase the home’s features and benefits during Open Houses and Tours. 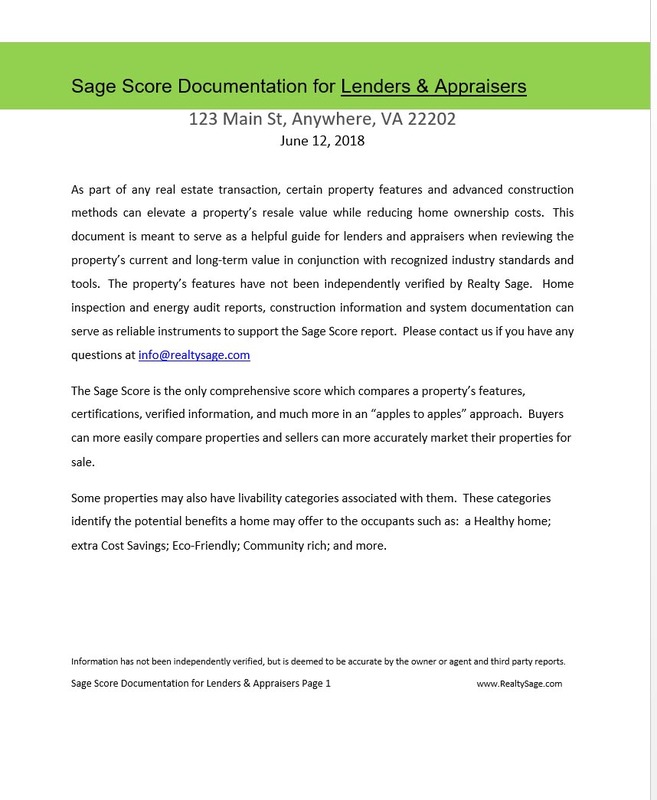 A custom flyer, a certificate, explanation about the home’s benefits and Sage Score, displays for various rooms (if applicable) and documentation to present to lenders, appraisers, and home inspectors on the home’s potential benefits and potential increased market value. A custom flyer that you can use at Open Houses and Buyer-Agent Tours. 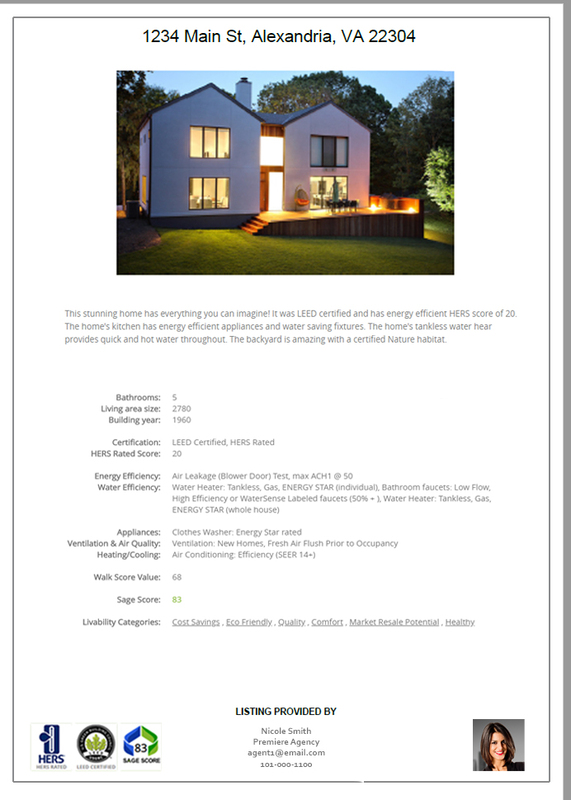 Includes listing and agent photos and details such as descriptions, agent information, Sage Score, Livability Categories and any third party certifications. Marketing displays are excellent resources for home tours and open houses. They showcase features grouped by rooms and by type. Place these displays in room or provide an overview of the energy, water saving, and premium features all at once. 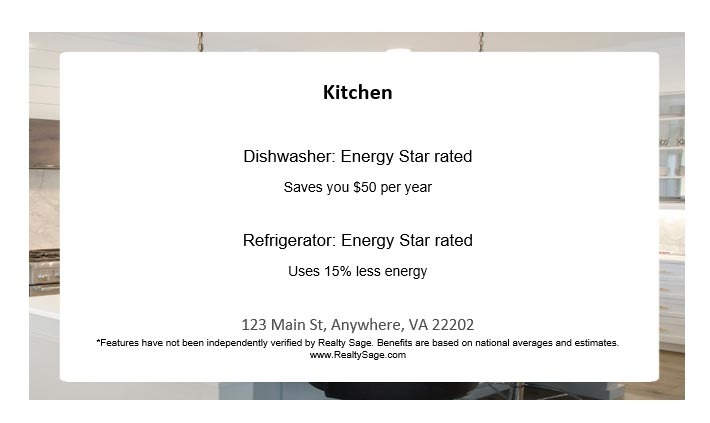 For example a Kitchen Marketing Display may list premium appliances and water-saving fixtures and would be helpful topotential buyers when touring the home to understand these premium features and their potential benefits including cost savings, health and eco-friendliness. Print as many displays as needed. To make them really stand out, place them inside a sheet protector or display stand and reuse them for your next listing. Contains your property listing's Sage Score that you can showcase to buyers and provide to your seller clients. 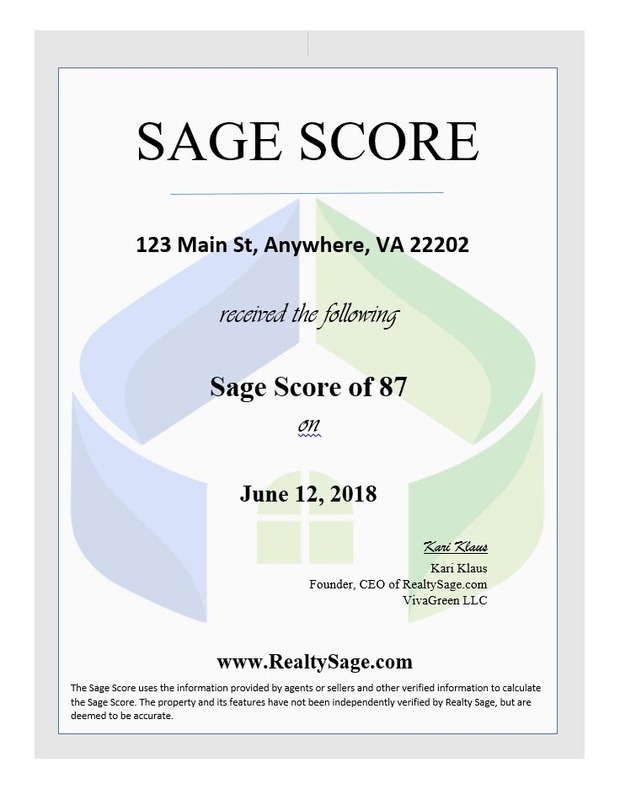 Your Sage Score listed with details about what range your Sage Score represents. Only $99 for the entire package of marketing materials. You can print as many as you need! And you can regenerate the materials with new content (eg, photo, price, comments, Sage Score, etc...) if you ever update the listing, at no additional cost. 1. For new listings. When you add your listing, under the "Optional Marketing" tab you can select the "Marketing Materials" option. For existing listings Access your "My Listings" section of your profile and cick on the dollar sign ($) icon. Then select the "Marketing Materials" package. 2. You can preview the documents before you purchase them. You can regenerate the materials to include any new changes, any time after your purchase, should you make changes to your listing or profile. 3. Once you make your payment, you will receive an email with the marketing materials in PDF format. You can print as many copies as you want. * Disclosure: Our website contains affiliate and partner links. Some of the links, such as our optional marketing services and advertisements, are affiliate links. Meaning, at no additional cost to you, we will earn a commission if you click through and make a purchase.